YES ! I finished it ! More final images at the bottom ! PDD here ! for some reason it doesnt update/refresh my forum profile pic :(. This is my entry for ARTWAR2 ! This is the desired concept for the final 3D piece, hopefully I will be able to nail this look . More detail pics in below replies. this quickly showing my moodboard and quick sketches of for my entry 's idea. I will go into more detail into the back story and write more about her design in next update - final concept. For now I just got some quick doodle and a mood board :P. I hope I will finish her on time and no rushing this time. 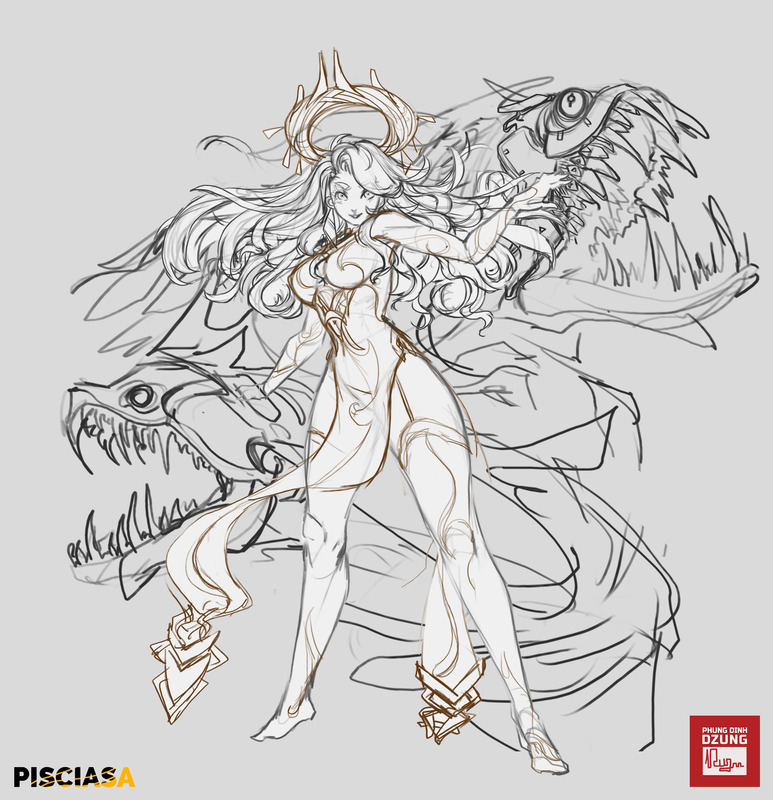 I will update some small WIP regarding Pisciasa on my Twitter and FB page before putting them all as a proper update here. So in case you might be interested ! 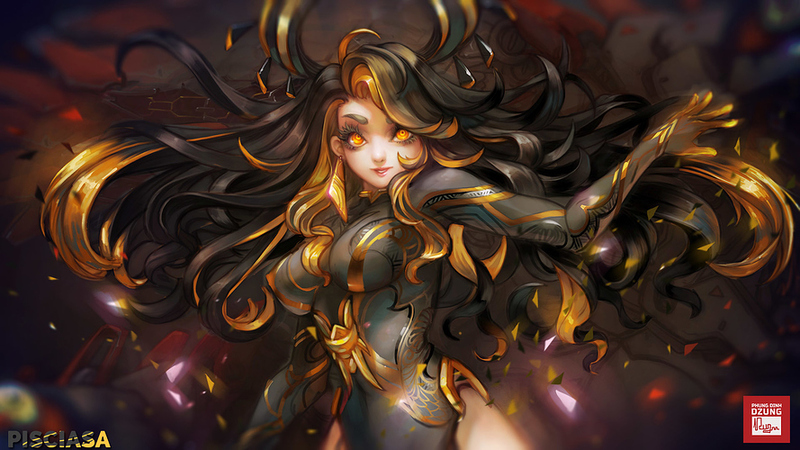 Ahh man I just discovered your work recently(Kamikaze mech - love all of them) and now your entering artwar... Such an awesome start. This looks really promising. Look forward to further updates. Nice concept there @phungdinhdung! Looking forward to seeing her all flushed out! Mmmm that is a yummy concept. Looking forward to the execution. Glad to see you enter. 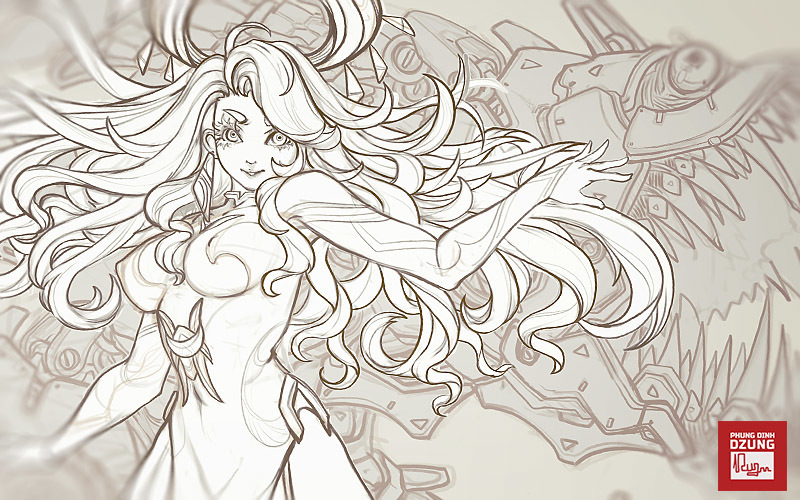 I really like how you're putting a bit of mechanical pieces into the heads behind her. Think your going for hair shaders like Exparia? @malccom : Thanks man ! yeah the Kamikaze one was for my long time Artstation challenge. But it was dragged for too long and I planned too many thing for that one so that I didnt finish it on time XD. I will sort everything out more nicely this time so that I wont have to be so rush for this one 's deadline submission. @javi_oses Thanks ! Actually I am planning not to use Zbrush heavily this time, but just draft sculpt to quickly block out the big proportion, I am thinking of modeling out all the detail within Maya for more accurate and cleaner result :P.
@brohmyr : Thank you ! @RogerP: thanks ! am looking forward to it myself too lol . @Zerraze : Thanks, they are mech - dragon fishes living at bottom of the dead sea . 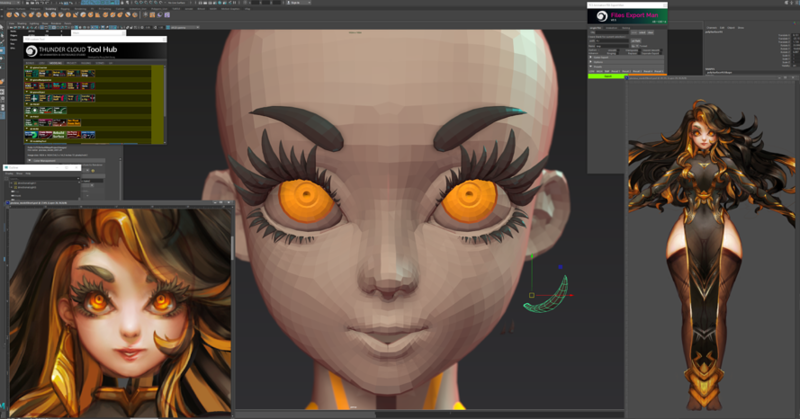 The Hair like Exparia would consume times and they might not work for such long hair, so I am still thinking if I have to manually model / texture them all XD. Okie, Here we go . 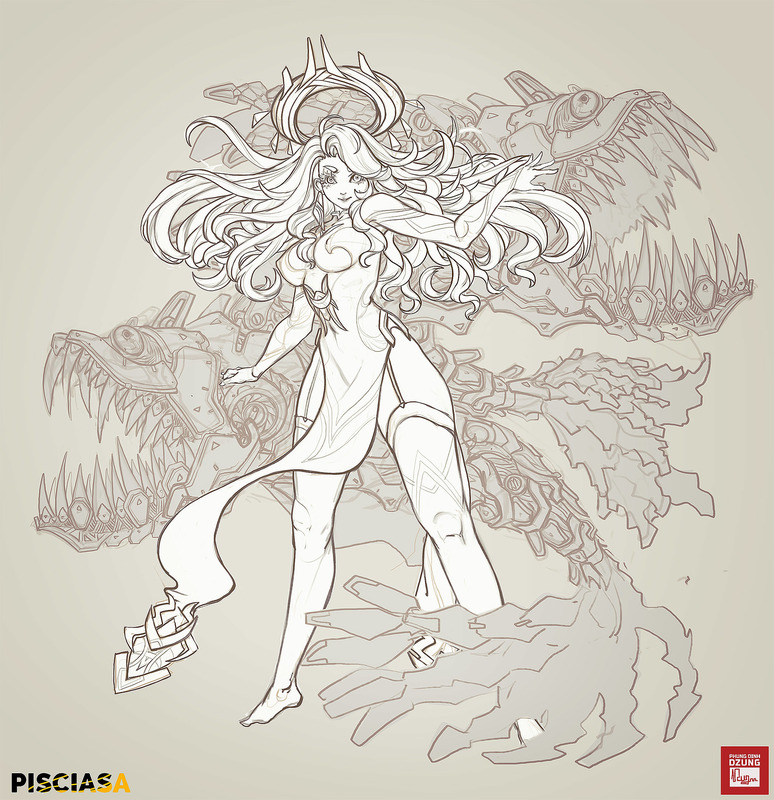 just finished the linart for my concept art. 2 days of work so far. I gotta work a little bit on the color tone before moving on modeling her and the duo fishes. superpower co-exist with bio mech monster. I designed her based on my horoscope signs - pisces that 's why she got 2 fishes swarming around. These are modified bio mech dragon fish, kind of fish that are only found at the very bottom of the sea where light cannot reach. 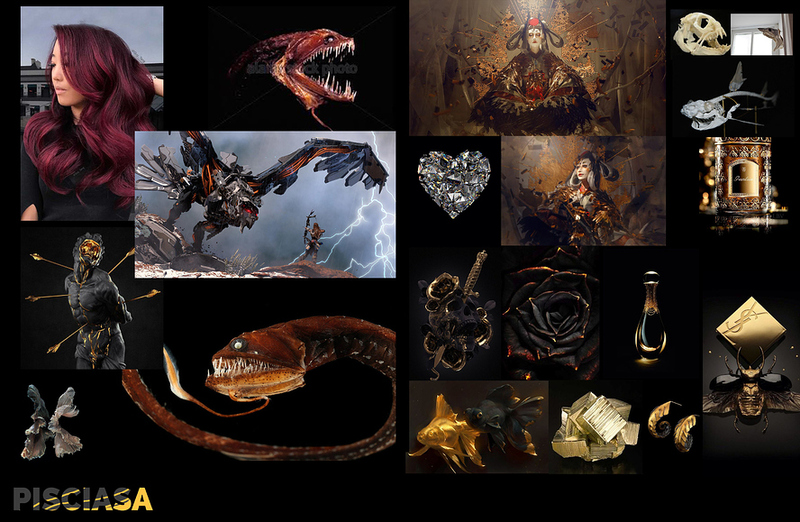 That 's pretty much my base idea for Pisciasa, well enough ranting for today update :P. I have more to come so gotta save them up for other updates as well lol. Damn now I wish I based my idea on Aries since I am a Aries. This looks awesome. I look forward to see how you tackle the mechanical bits of the fish as well as the coloring of the character. From your reference, red and golds seems to be nice choices but of course, thats all up to you. I also did a concept for a Aries based character ( as my wife is Aries lol ) and in middle of modeling stage of the project then Artwar2 show up so I decide to temporary put it on hold . The mechanical bits of the fish are mostly based on Horizon Zero Dawn so more or less I will try to replicate the look from them . Yeah , Red and Gold is basically what I am having in mind too, primary color will be matte carbon black and shiny silky black ! Sounds awesome. A matte carbon black sounds awesome. 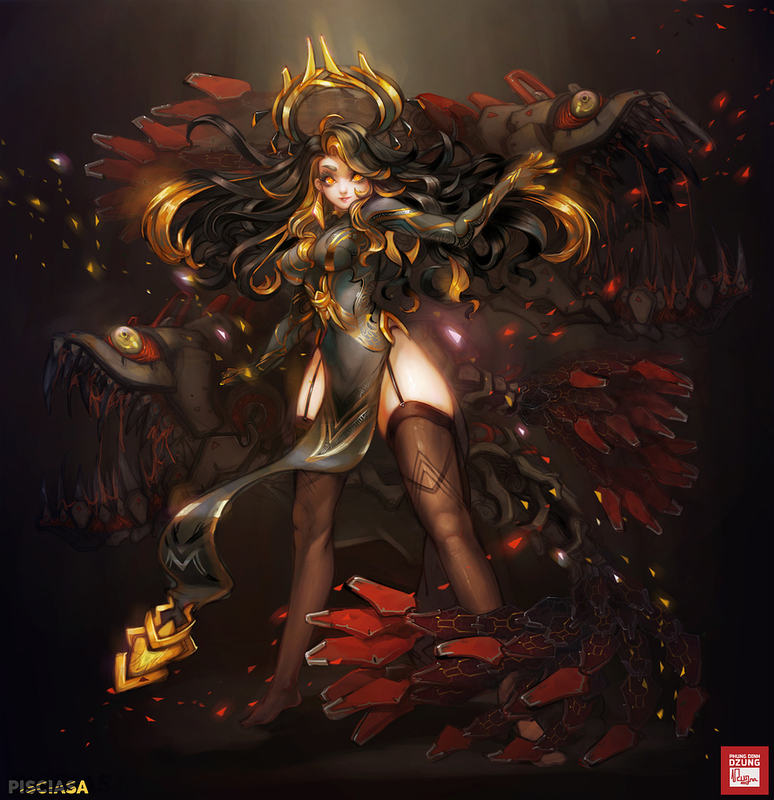 Damn, now I want to see the Aries piece as well. When artwar is over. ! just finished my color concept ! ah right , I got a little Step by Step Gif, Hope you enjoy it ! This looks absolutely incredible. If you manage to create the same masterpiece as a 3d model you most likely going to win. Looking forward to the progress. Best of luck bro. The concept is amazing. Love the colors. They're more amazing than I was expecting. Wow...that's a fantastic concept! You put WAAAAY more effort into your concept than I did on mine. I'll bet she looks all the better for it though - Lookin' gorgeous!